The sky over Tahoe started 2017 with quite the resolution. For years, the snow in the garage had been piling up, and then the closets became full. Ceiling high piles of powder were crammed everywhere in the house. The sky had a problem, a snow hoarding problem. It was time to stop and turn over a new leaf. 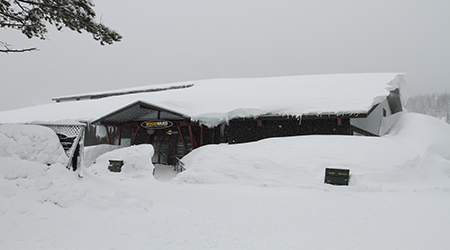 With this resolution, the snowpocalypse season for Tahoe began. The sky dumped out massive amounts of snow. The purge felt so good, it became all the sky wanted to do. Fast forward to the beginning of February. Zoom in and see the ginormous snow walls of the Boreal parking lot. The buildings were just barely peaking out. This season the sky had discarded over 400 inches on Boreal. At this point the sky had really made some progress on it’s garage. It was time for a power washing - which led to it being a little gnar-gnar-escobar out on the hill. It was wet and blowing (insert mom joke). Which led to only three lifts being able open. There was hope - when el squat and the samoan picked up the passes from the depths of marketing, they were told that the Cedar land had just been opened. They went to there. And were like - um, how come this is all untracky? Then they were like mow mow mow - hike out. Mow mow mow mow - hike out. They they ate some gummy cherries. Repeat mow mow mow - hike out. Dopeness - bo real. Boreal is usually the first resort to open in the Tahoe area every year. Boreal came out as a resort in 1964. That year in American: Racial segregation was abolished with the Civil Rights Act. The Beatles came to America. The government said - um smoking all those cigs might be bad. Ford made the Mustang. Cassius Clay became the heavy weight champion of the world, and then became Muhammad Ali. Shea Stadium opened, and three New Jersey heads opened the 1st Blimpie. Ride the Magic is the official video game of Boreal. The mountain gives you discounted lift tickets when you play. It's $15 - $25 to ride on Fridays. There are seven parks and the Mini Wave Park is coming soon. The hours of Boreal are 9 AM - 9 PM. Woodward Tahoe also lives here. The indoor training park goodness. There are tramps, ramps, a skatepark, mini ramp, and foam pits galore. Consensus - radaroni - but we must come back for the playing in the park. Thanks for having us Boreal!